With the centenary of the First World commemorated during 2015 around the world, interest in the first ever war in the air is at an all time high. To view probably the best museum devoted to the origins of aerial warfare you have to travel to the somewhat unlikely destination of South Island, New Zealand. In the heart of the wine-producing province of Malborough you will find the historic Omaka airfield on the outskirts of the town of Blenheim. Here a group of local enthusiasts with the assistance of local government have created an aviation exhibition that is in a class of its own. Perhaps because I am a teacher by profession, I tend to look at all museums in terms of their educational value, both for adults and children. Unlike most aviation museums that are a collection of static exhibits, Omaka attempts to put most of its aircraft into context by way of life size dioramas that each tells a story. Learning about history, in this case the genesis of the world's first use of aircraft in a major war becomes a stimulating and enlightening experience when the exhibits are presented in such an imaginative fashion. The museum's philosophy in designing the displays was to achieve the maximum degree of realism by using techniques from the film industry. In this respect, having the well known New Zealand director Peter Jackson (of Lord of the Rings fame) as one of the trustees was a double bonus. 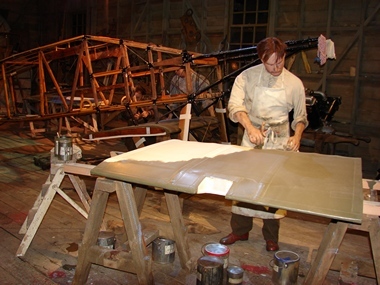 Not only is this era of aviation his great passion, one on which he has spent a considerable amount of money collecting aircraft and artefacts, but his film company is ideally placed to build for the museum its replicas and lifelike mannequins, together with the realistic settings in which these appear. Dramatic lighting, also drawing on the expertise of the film world, further enhances the displays. Another key decision in planning this museum was to design most displays around full scale replica aircraft that are completely accurate in their external appearance. 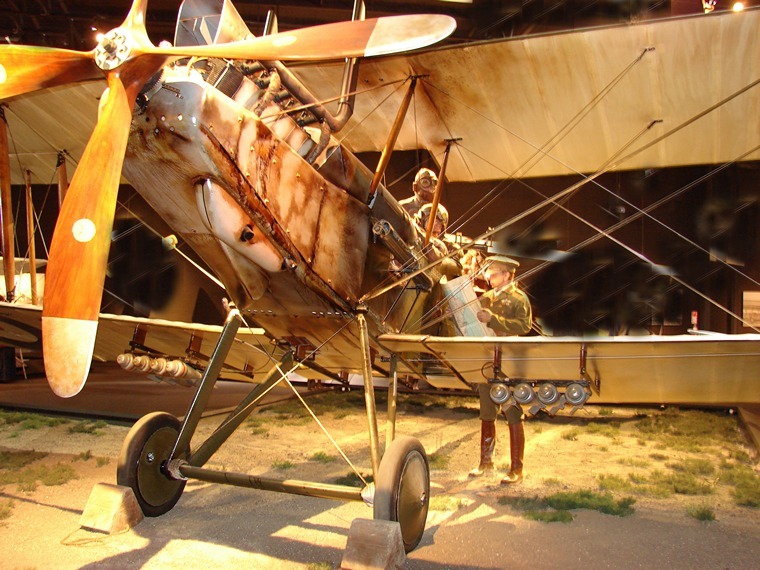 This approach has several advantages, one of which is that replica aircraft can be displayed in realistic settings complete with simulated battle damage that is not desirable when working with rare original airframes. Every vignette is designed to show an important aspect of the early evolution of aerial combat. The first of these shows a German Etrich Taube with its observer firing a rifle at an approaching British BE2. The Taube, with its distinct birdlike wings, is a full-size replica while the BE2 is a large model. With clever use of perspective the two planes seem in correct proportion and the concept of aircrew in these reconnaissance aircraft taking pot shots at each other with small arms is effectively conveyed. Having turned aircraft into offensive weapons, the next question for the air arms of the warring nations and therefore their aircraft designers, was how to most effectively arm their aeroplanes, particularly with machine guns. 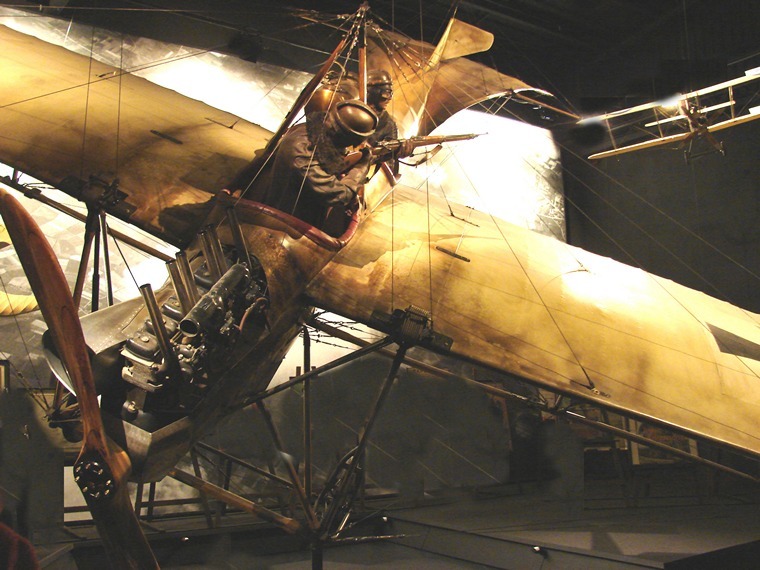 The next exhibit shows the two major methods adopted in 1915, one involving the placement of pilot and machine gun and pilot ahead of the propeller in a pusher design such as the DH2 and the other the invention of an interrupter gear that allowed the gun to be fired through the propeller as pioneered by the Fokker E1 Eindekker. Two full size replicas of these aircraft types shown in a tail-chase combat, illustrate the means by which guns could be aimed at the enemy by aiming the aircraft. Although part of this display, the DH2 is a flyable aircraft that has featured in past air shows at Omaka. 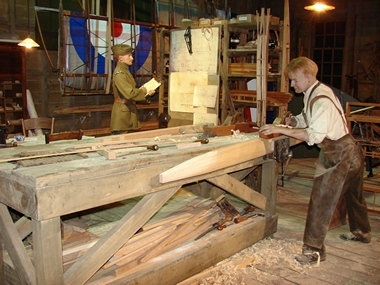 The origins of aerial bombing are also portrayed in one of the displays. The observer in a German Albatross B II is show dropping a bomb over the side of the cockpit, aiming it simply with the naked eye. From these crude beginnings, aerial bombing technology would advance rapidly over the next few years. Perhaps inevitably, at least one display had to be devoted to a dawn patrol and it is a beautifully constructed RE 8 which forms the centrepiece for this theme. The much maligned "Harry Tate" (in rhyming cockney) was one of the types used in large numbers on the Western Front, despite its vulnerability to enemy fighters and it is apt that it should be included here. 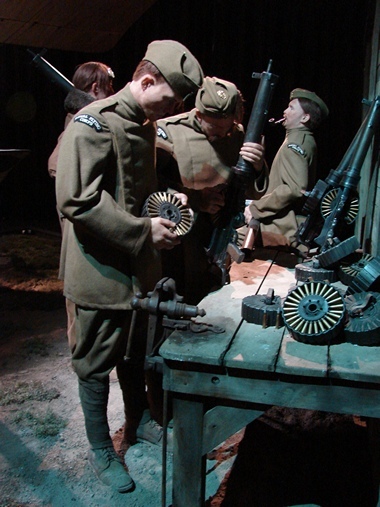 Acknowledging the role of ground crews in squadrons, the figures shown preparing the aircraft include armourers loading the ammunition drums of the Lewis guns. 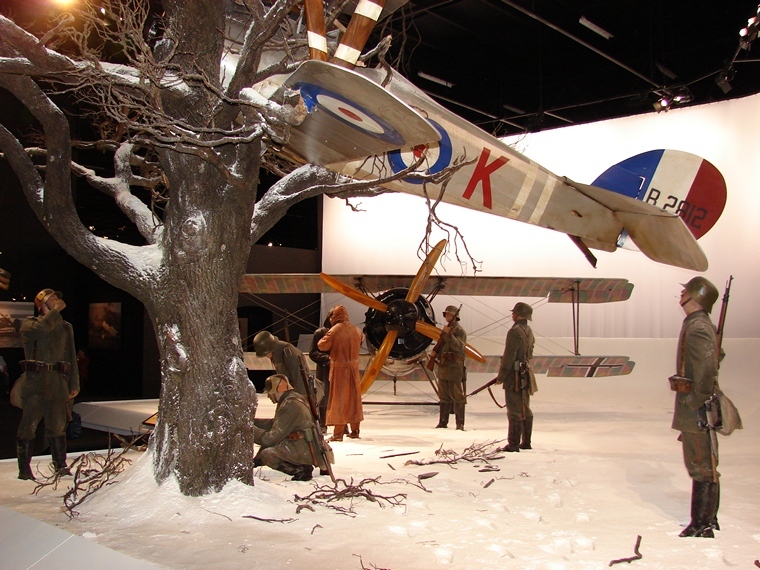 The most appealing life-size diorama in the museum is a winter scene meant to convey something of the chivalry associated with air combat in this war. In a snow- covered tableux, not based on any particular incident, a British pilot who has just been shot down meets the German aviator who was the victor in this dogfight. The Nieuport which had been crash landed in a tree is scrutinized by German troops while the mount of the German pilot, a Siemens Schuckert D.IV stands in the snow a short distance away. 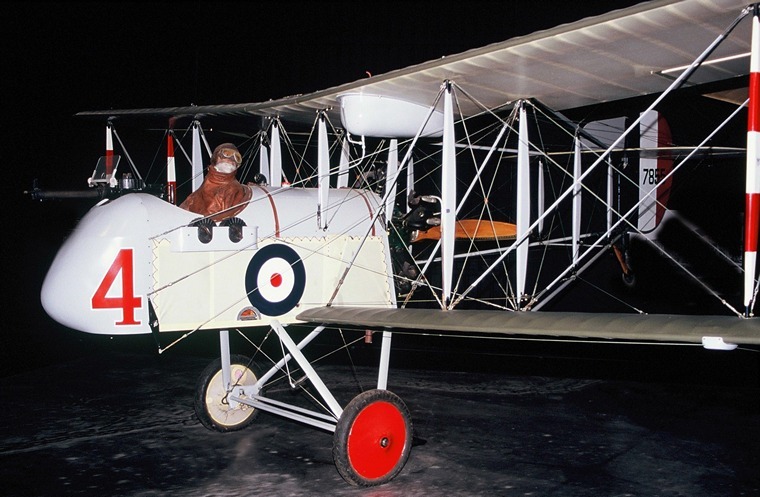 As a museum in New Zealand, once a British colony that contributed its share of pilots to the Royal Flying Corps (later the RAF), it is only right that some exhibits have a Kiwi flavour. The remarkable story of "Grid" Caldwell lends itself well to a graphic representation. Caldwell while leading 74 Squadron of the RAF was involved in a mid-air collision during a combat flight in September 1918. With the left wing and ailerons of his SE5a badly damaged he found that the only way he could maintain control was to climb onto the offending wing and fly the plane with the stick alone. In this way he flew down from 7000 feet to just above the British trenches and at the last possible moment threw himself off the fighter plane and into the mud below. Not only did he live to tell the story, but he became the top-scoring New Zealand pilot of the war with 25 victories, ended his career as an Air Commodore in the RNZAF and lived to the ripe old age of 85! The exhibit at Omaka shows Caldwell in the SE5a just before he literally "jumped to fame". One of the dangers of a museum of this nature is that it could romanticize the notion of the gallant "Knights of the Sky" to the extent that one loses sight of the fact that the First World War in the air was no less a deadly conflict than that on the ground. To its credit, this is not the case with the Omaka museum which has at least two exhibits that are sobering reminders of the fact that once mankind took aircraft to war there would be some grim consequences. The first, positioned early in the sequence of displays, shows a Morane Saulnier BB that has crash landed on the edge of an aerodrome the Western Front. A mortally wounded observer is slumped in the rear cockpit of the plane which has been peppered with enemy machine gun fire. The wounded pilot is being dragged from the cockpit by ground crew who hail a nurse driving a Model T Ford ambulance for assistance. It is a scene that pulls no punches. 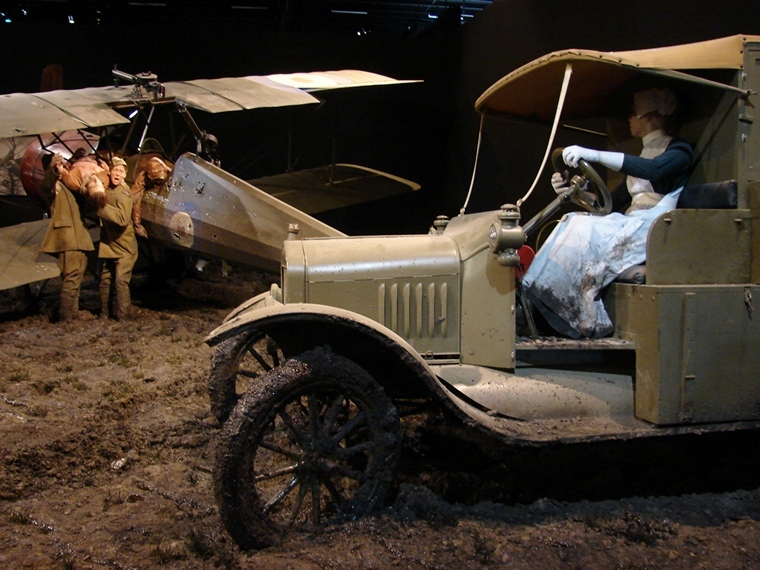 A further diorama showing the grim realities of war represents the scene shortly after Baron Manfred von Richthofen, the famed "Red Baron", was shot down in 1918. Australian troops, whose comrades may in fact have fired the fatal shots at the low flying Fokker Triplane, have started stripping not only the plane but its legendary pilot of anything that could be carried away as a souvenir. The insensitive "cobbers" apart from cutting fabric from the triplane, removed the boots from the pilot's corpse! The scene, recreated on a circular platform, can be viewed from any angle and is a touching reminder that even the greatest of pilots are ultimately mere mortals. 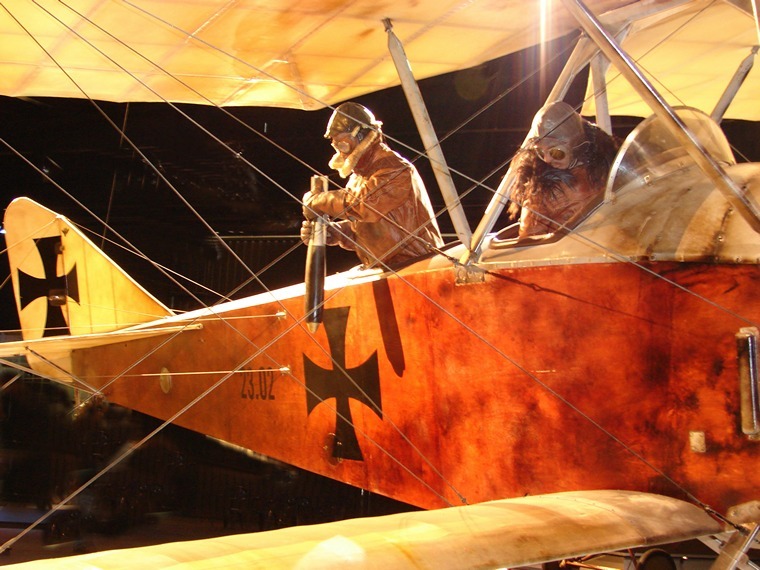 The damaged Fokker Triplane is one of several private homebuilt projects bought from around the world and utilized in displays in this museum. The damage to the all-red triplane was apparently achieved using a fork lift truck to deliberately break the wings, with the results being indisputably realistic. On display adjacent to this scene is the largest collection of relics relating to Von Richhofen to be found in any one museum, including some of the items originally plundered as souvenirs on the fateful day he died. 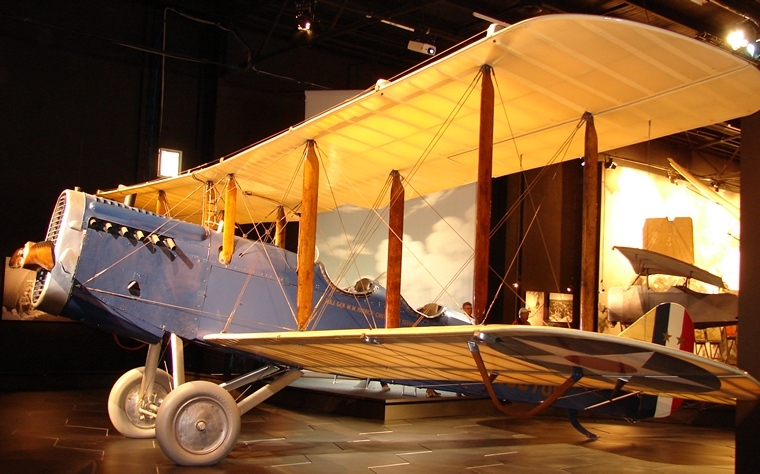 Although the majority of aircraft in the museum are replicas, a number of original airframes are on display. 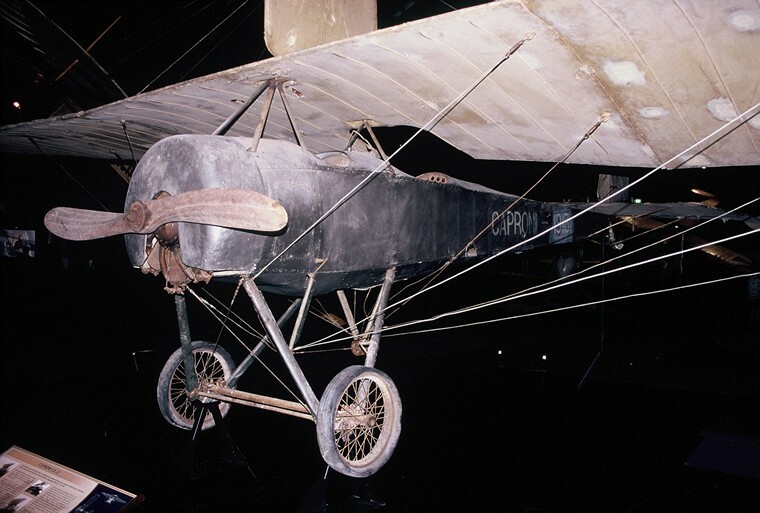 Entering the museum one sees the first of these, a 1913 Caproni CA22, the last of its kind in existence. The airframe is a real time capsule having been left un-restored and displayed as found in northern Italy complete with linen covering dating back almost a full century! Also featuring in the museum is the original fuselage frame of a Bristol F2b Fighter being repaired in an extremely convincing workshop display where attention to detail extends down to a butterfly in the window. Finally an original American-built DH 4M which served as a US mail plane in the 1920s has also been added to the collection. Adding a further dimension to the World War One theme of the museum are several aircraft that were built for movies set in this period and made in the 1960s. The most famous (and arguably best) of these was The Blue Max and two of the Pfalz D.III used in that film are now owned and flown by the museum. These replicas have become historic in their own right having been built some fifty years ago and well before the advent of the less than satisfactory CGI methods used in most modern flying films. 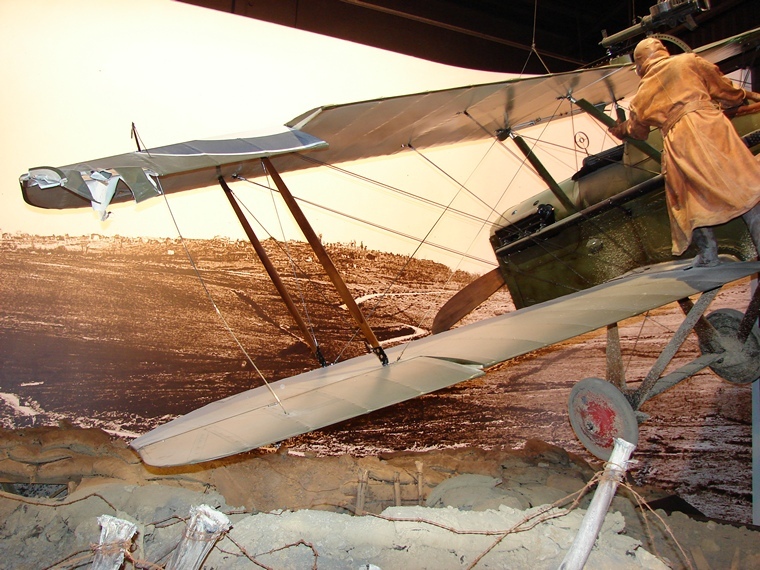 The museum's main theme ties in perfectly with the biennial Classic Fighters air show held at Omaka which always features a range of World War One aircraft and ground displays. Add to this the natural beauty of the region and you have the perfect excuse to plan your visit to this part of the antipodes to coincide with the flying event. The long term plan is to expand the museum in phases, with the inter-war era being next in line. If these plans come to fruition and the same standard of displays is maintained, then this museum may come to have no peer in telling the story of how man took to the air in earlier decades. The New Zealanders who have made this museum a reality can be very proud of their achievement which raises the benchmark for aviation museums everywhere.